The environment research area is part of the MODEST Challenge. It lies at the crossroads of transverse axes “Data assimilation and optimization” and “Uncertainties“. 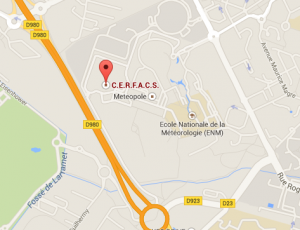 Within this axis, CERFACS teams conduct scientific studies in various fields of geosciences. Researchers and engineers develop modeling tools, implement data assimilation methods, run coupled models (multi-physical and / or multi-dimensional) and study the sources of uncertainty on systems. One goal is to apply this research in operational systems in a national and international context. The methods of applied mathematics used here, such as coupling or data assimilation, are at the center of research works in the fields of oceanography, atmospheric chemistry, hydrology and forest fires. Flood forecasting is a major natural hazard for the safety of goods and people. Actors in risk management and stakeholders in water resource management feature modeling tools and in situ observation network to simulate the flow dynamics. The capabilities of hydrological and hydrodynamic models are limited by several factors of uncertainty related to the description of the bathymetry / topography, hydraulic and hydrological parameters, or the terms of forcings such as hydrological flows and rainfall. These uncertainties can be reduced through data assimilation (in-situ and satellite), as implemented in the DAMP platform (Data Assimilation with MASCARET Platform). Predicting the behavior of a large-scale fire depends on a semi-empirical modeling of the propagation of a front (i.e. the interface between burned and unburned areas) involving the vegetation data description, geomorphology and meteorology, however tainted by various sources of error. CERFACS develops the ensemble data assimilation system FIREFLY to sequentially correct the fire front parameters and position, and thus improve the predictive ability of the propagation models over the acquisition of observations on the front position.